The construction of the vinyl swimming pool concrete walls consisted of assembling aluminum molds while after the walls are then poured, reinforced with rebar. The pool floor base was made with dry-pack sand and cement materials to harden and avoided foot prints. One large light was installed in the deep end and one small light was installed in the shallow area. The pool also had two wide-mouth skimmers encased in the concrete walls along with four returns and two deep end bottom drains. 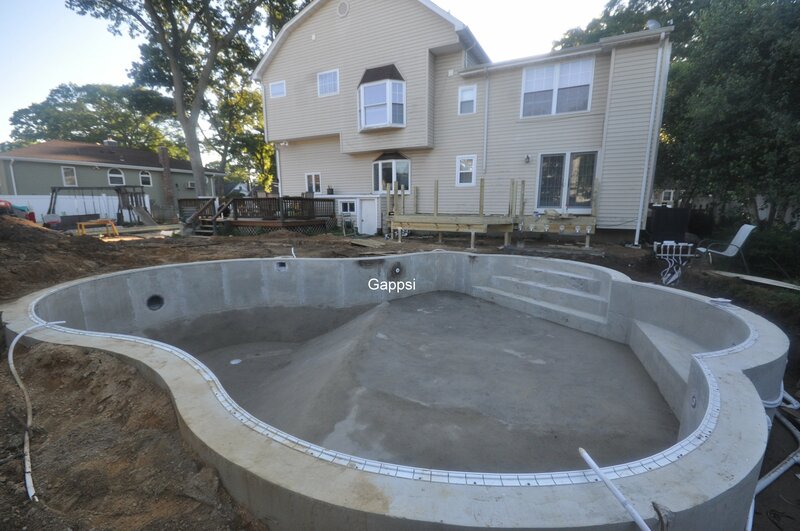 After the installation of the Loop-Loc textured liner, the coping and patio were installed using Fiorito and Moca travertine pavers. An ice chest was installed next to the pool bench in the shallow area for easy access to refreshments. A TimberTech deck was also built coming out of the sliding door with railings and steps. All pool equipment were from Pentair, including the gas heater, pumps and filter, and salt chlorine generator.